I recently bought a big pack of canned Pineapple chunks as I wanted to try some recipes with pineapple. For the first recipe, I tried using pineapples in a curry form that would go well with chapathis. First I just added chickpeas to it, but later wanted to add kidney beans too, just wondering how they will taste with pineapple. But to my amazement, they all co-operated very well and turned into a delicious, aromatic and colorful curry within minutes. Grind together pineapple chunks (don’t add juice) + green chilies + cilantro into a fine paste. No need to add water as pineapples already has some juice in them. Keep aside. 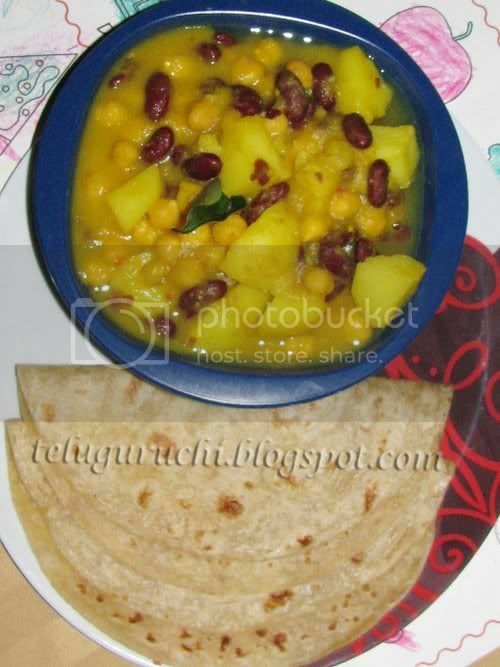 In a pan add chickpeas + kidney beans + potato pieces + curry leaves + cumin seeds and oil. Mix well, add ¼ cup water and turmeric, cover and leave on medium flame until all the water is absorbed and potatoes are cooked well (approx. 5 minutes). To this, add the pineapple paste and mix well. Leave the pan for 5 more minutes until all the pineapple essence is absorbed and turn off the flame. Don’t let the curry to become too dry. It should be moist and gravy like (look at the picture). Adjust salt. 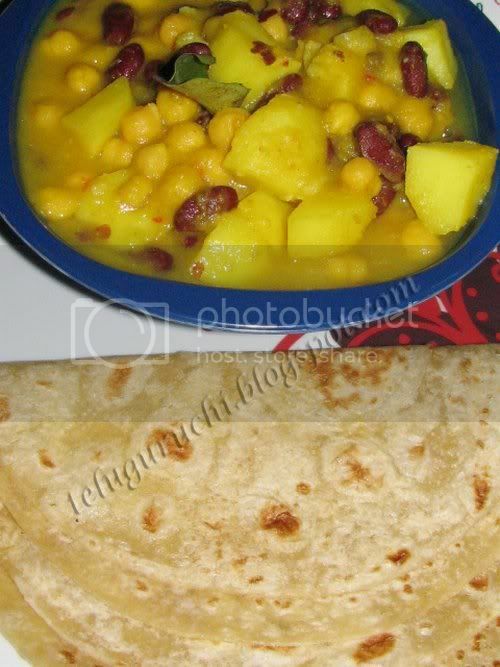 Transfer the yummy curry into a serving bowl and enjoy with your rotis/chapthis. Hope you liked another crazy but yummy creation from my kitchen!! I have tasted only pineapple pachadi..Sounds delicious. shall try it some time. I have added pineaple in chinese dishes and in the curry sauce i make whichilove. Love this curry i am sure i would love the taste. Oh,Uma,I love this combo,should be tasting so tangy and yummy!! Interesting one..Nice color to the curry..
creative as ever..this one looks really delciious..
wow... i am a pineapple lover. seems like this will be very delicious. I too posted a chickpeas curry, yours sounds more healthy and more legumes means more proteins!!! and the pineapple addition is a perfect twist love the color!!! hat sounds tangy with a medley of flavors! That is a great idea and really looks delicious! Woow wat a unique dish Uma...Looks fabulous!!! I love pineapple and like it in some savory dishes like pizza, fried rice & thai curries.. this sounds very interesting. Wow what an interesting combination. It looks so yummy. hey uma, how have u been? I love anything tht has pineapple. This looks like a yummy curry. Little khaata little meetha. Very yummy and innovative dish. Have a great Summer, see you in Fall. That is quite a pairing! I use chickpeas and rajma together sometimes, but the pineapple gravy really caught me! 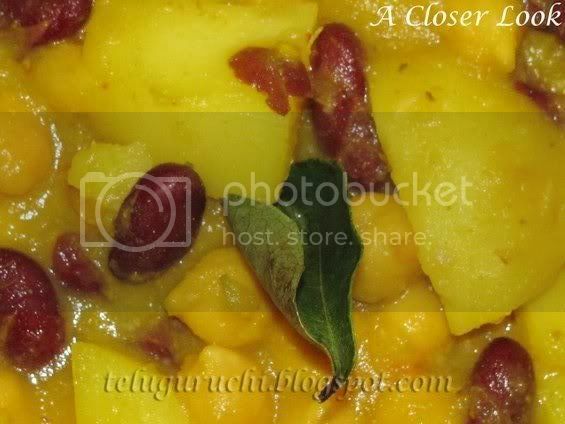 Ohh every time i visit your blog i will be thinking how a person can be so innovative :) I would have never thought of this combo..Perfect recipe. Interesting recipe...nice idea of using pineapple in such a gravy.Great combo! Wow.. Its fabulous creative dish.. SOunds total Yumm to me. Very creative Uma...looking yummy..Does it taste sweet? Unique Fusion Uma! This is really a aromatic, delicious curry..
Did you make those rotis? They are a perfect round!!! I love anything that has to do with Pineapple. ummm very interesting idea uma pineapple as a base very nice yellow color sounds yum yum.Let me try. Uma, this is such an amazing idea. Bookmarked! 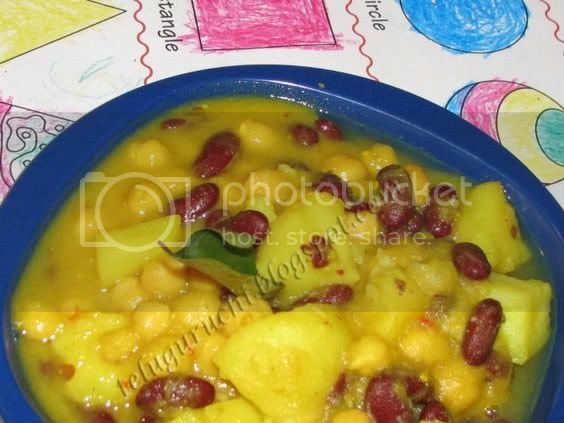 Very different, healthy bean, combined with pineapple yummmy!!!! i love pinapples but never tried them in curries....this is truly crazy.....worth trying. thanks for dropping by, i got a chance to come to your beautiful space...keep in touch. Very creative :) Looks like a huge bowl of goodness and sunshine!